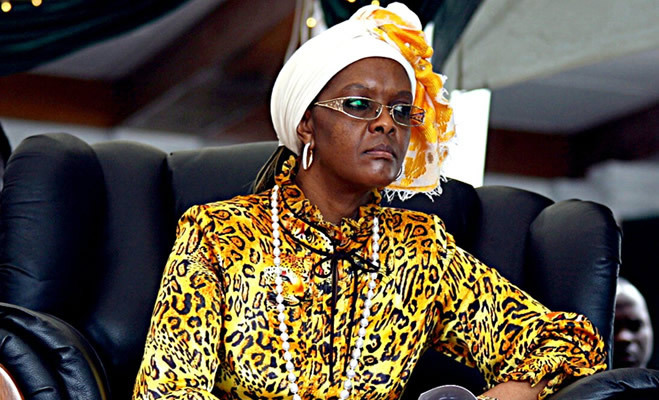 ZIMBABWE – Grace Mugabe’s rally in Chimanimani last week was preceded by a row in Zanu PF over the venue of the trail-blazing First Lady’s stop in Manicaland province. President Robert Mugabe’s wife eventually chose Chimanimani where she spent millions donating various goodies to the local party faithful, including suits for local chiefs. It has now emerged that Grace’s target was Zanu PF’s Chimanimani West Member of Parliament, Munacho Mutezo. The legislator was one of the ministers fired from government for allegedly backing the claimed coup plot by former vice president Joice Mujuru. Mutezo was deputy energy minister where he was accused of using funds from power utility ZEZA to finance the alleged coup plot. Party insiders said Mutezo is set to be recalled from Parliament and replaced by the wife of current energy minister and acting Zanu PF Manicaland province chairman, Samuel Undenge. There was a political intent to the First Lady’s generosity at Mutambara Mission last week, said a Zanu PF source. She (Grace) was actually campaigning for Undenge’s wife, Letina, ahead of the prospective by-election in the constituency. Mutezo’s days are numbered. As I am speaking to you, a purported petition by locals people has been dispatched to the provincial chair (Undenge) demanding the Mutezo’s recall. Reached for comment, Undenge said the MP’s fate was now in the hands of the Zanu PF politburo. We need to follow the wishes of the people, he said. People from Chimanimani West no longer want him and so we are waiting for the response from the party. The petition was signed by the people who are angry with Mutezo who was involved in a ploy to remove our President from power while he was a provincial executive. Asked whether his wife is earmarked replace Mutezo, Undenge said party procedures would be followed in selecting the right candidate. When the seat has been declared vacant then primary elections will be held to find the right candidate will come from the people, he said. The acting chair rejected allegations that he mastermind the anti-Mutezo petition by co-opting those who signed the appeal into the Cashel Valley empowerment project. Mutezo refused to comment on the developments. There is no love lost between Undenge and Mutezo. The two have previously sought to represent Chimanimani with Mutezo losing and accusing his rival of vote buying.